HILO, Hawaiʻi - The hearing on the Olson Trust applications before the Windward Planning Commission was continued to the next meeting, but the public still had a chance to testify. (BIVN) – A hearing on applications to change the zoning on land between Clem Akina Park and Dodo Mortuary in the Puueo-area of Hilo was continued to the next Windward Planning Commission meeting in May, but not before the public had a chance to weigh-in. 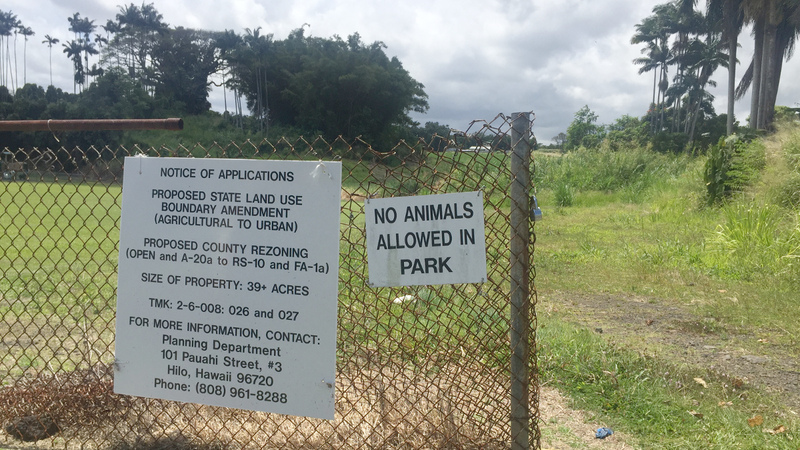 Two testifiers spoke at the April 4 commission meeting held in Hilo, and questioned the land title held by the Edmund C. Olson Trust on the agriculturally-zoned parcel. “These lands are actually leased under King Kalakaua,” testified Dwight Vicente, diving deeper into Hawaiʻi history. Commissioner Jon Replogle asked about the drainage and the condition of the ag land. “I was told this: that many new subdivisions are happening as result of needed housing and those small areas were impractical to farm because of what they would do with adjoining people living there,” Replogle said. Enocencio recently had a lease on nearby agricultural lands through Kamehameha Schools. That situation is currently in litigation, Enocencio said.